Addonics revealed the NAS 4.0 adapter. It enables you to connect up to 16 HDDs over a LAN, if you use USB hubs or SATA port multipliers. 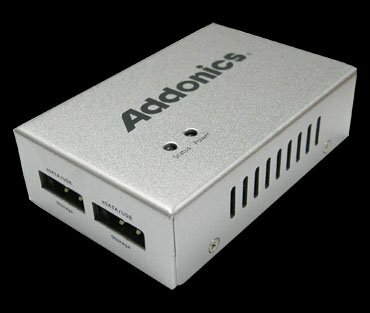 Addonics Technologies (www.addonics.com) today announced the Addonics NAS 4.0 adapter, which lets you share as many as 16 hard drives over a LAN with 1 exbibyte per drive volume and at a fraction of the cost. The NAS 4.0 is Addonics' 4th generation NAS adapter with several major enhancements. It comes with two eSATAp ports that allows users to attach two eSATA or two USB 2.0 storage devices onto the LAN, or as many as 16 storages devices (or drive volumes) using USB hubs or SATA Port Multipliers. With these many drives, you can easily share multi-Terabyte storage over a LAN or build your own private cloud storage that can be accessed via the built-in FTP server. One exbibyte equals 1 million terabytes and demand for such big data tools is already taxing the storage capacity of scientific researchers, online game providers, digital video studios, stock markets, government and military installations and financial services companies – all of which will be looking at exbibyte storage within the next year. Performance of the NAS 4.0 adapter has quadrupled from the previous Addonics adapter to more than 75 MB/sec over a 1G network. Both the maximum number of SMB and FTP accounts, as well as the concurrent users supported by the NAS 4.0, is vastly expanded to support over thousands and hundreds respectively. The NAS 4.0 also supports storage devices with multiple partitions, with each partition appearing as a share folder on the network. The supported file system now includes XFS, EXT2, EXT3, EXT4, NTFS and FAT32. A storage solution exceeding thousands of Terabytes can be easily built by attaching multiple Addonics RAID Towers or RAID Racks at just a fraction of the cost of an enterprise storage system. Constructed in a rugged metallic housing in the size of a cigarette pack, the NAS 4.0 adapter is built to last and can be deployed in almost any computing environment. The NAS 4/0 has a MSRP of $89 and is now shipping.